These Halloween safety tips for trick or treating will help make sure your kid have a safe and fun night! There was a time when the biggest worries about Halloween involved what costume your kids would wear and how much candy they would be able to score. Now, there are dangers involved with trick or treating that you simply can’t ignore as a parent. Despite the dangers, Halloween trick or treating can be a ton of fun and safe at the same time. Here are some Halloween safety tips that will keep your kids safe this coming season. Unless your kids are much older, you should be going along with them for their trick or treat sessions. This seems like a no brainer, but you would be shocked at how many parents still send young children out without joining them. Don’t trust other kids to keep your kid safe. That is not a good idea for Halloween safety. This means arming them with a well lit (affiliate link) flashlight and making sure they have on some reflective portions of clothing. Yes, it might get in the way of their darker costumes and such. Let the child be upset if they must, but enforce this rule always. A kid that is not seen on Halloween night is a kid that is in serious danger for oncoming traffic. Know the kids that are trick or treating in your kid’s group and go over the rules completely with them all. Stick together throughout the trick or treating and never wander off alone. This is also where you tagging along comes into play. You keep your eyes on your child all the time and you will know when they break those rules. Candy and treats have to be inspected by mom or dad before anything is eaten. Make sure they know that if this rule is broken, all candy will be forfeited. Explain to them the reasons behind this Halloween safety rule and you will have less resistance. It is sad, but it is a reality in our world we can’t ignore that treats are sometimes unsafe. You being there helps, but sometimes they will be up near the door of the home with you at the street. Make sure they understand that treats are to be given only at the front door. Never allow them to go inside no matter the reason. Lord forbid your kid gets lost, he or she needs to know how to contact mom and dad. There should be a complete list of information needed if your kid is lost on them at all times. This is actually true of everywhere they go, but particularly so on a busy evening like Halloween. Even the most diligent parents have had kids go missing. These are Halloween safety tips that are vital to your child’s safety. Make sure you enforce these at a minimum and always trust your gut. Parents always know what is best for their children. 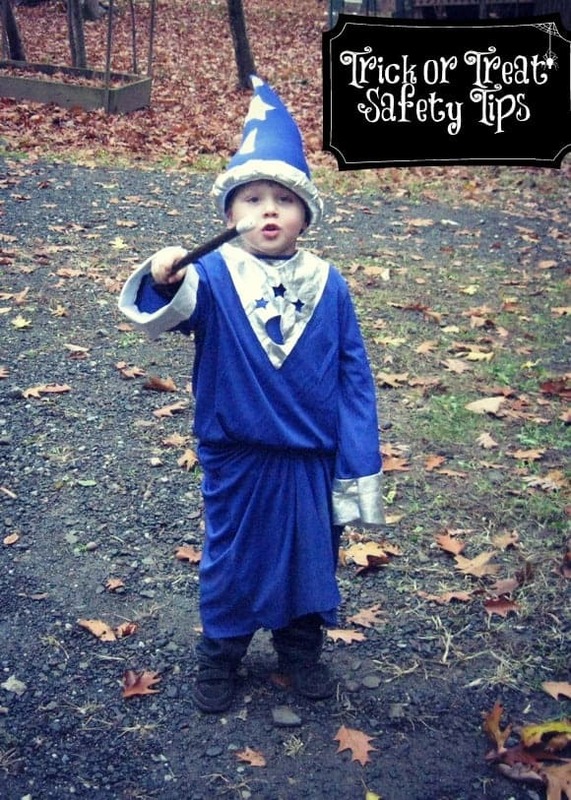 Do you have any other Halloween safety tips for trick or treating? Good ideas for staying safe. I will be showing my kids this list when they get home from school. Great tips, I will keep in mind! Really wonderful and practical tips! Thanks! Great tips on keeping kids safe! I passed this to my sis in law, she has 2 kids under 4! I’ll definitely keep these in mind this Halloween! Great tips…our area doesn’t have street lights so making sure my kids are visible is a huge one for us!! Everyone should read the tips, and spread them, thanks. Thanks for the timely article….Halloween is coming. I was surprised last year to see how late some of the kids were out. Our doorbell actually rang at 9:30 pm with small children! These tips are great timing. Halloween is coming up soon. They are all very important. I remember always to tell the kids No eating candy or treats until they get home.